Skiers play football during the 1960s in Wagner Park, where snow was plowed from the field. Football season sharpens my memories of days at Aspen High School. Aging athletes tend to inflate their sports highlights even if, like me, they spent most of the time on the bench. It warms my heart to watch AHS throw down a winning season. 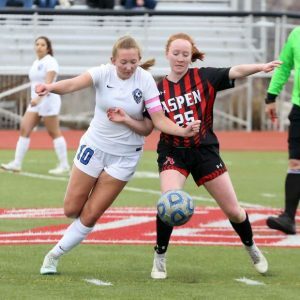 During my years on the team, Aspen did not shine as a league powerhouse. Some districts were consolidating, but we fit in the small-school category, along with Silt, Newcastle, Eagle, Gypsum and Grand Valley. 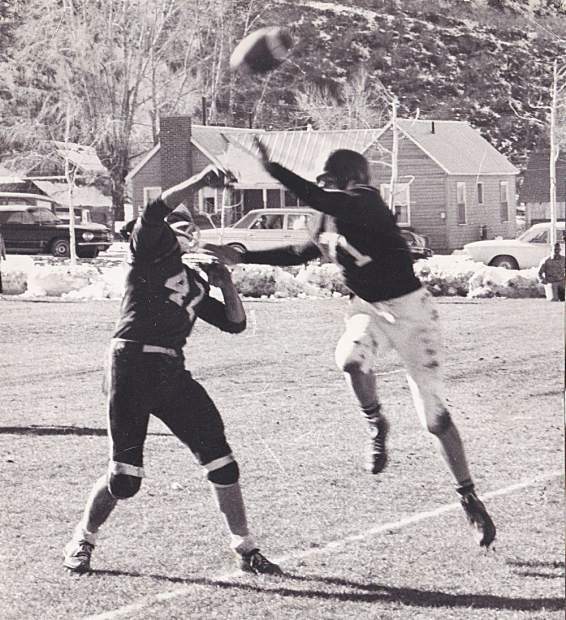 Prior to 1962, Aspen played mostly eight-man football. By 1963, the season began with only 14 players to play an 11-man game. A couple of years later, Aspen fielded more than 40 players. But girls were not allowed to play competitive sports. Throughout my high school years, AHS scored no winning records in football or varsity basketball. However, the JV basketball team nailed a couple of winning seasons. We played so poorly that other towns liked to schedule Aspen for their homecoming games to guarantee a win. This strategy intensified my highlight high school memory. During my senior year, we beat Carbondale at their homecoming. Carbondale was shocked; we were elated. The Skiers (upper case) basketball team traveled far for many games. A trip to Basalt or Carbondale did not tax us much. 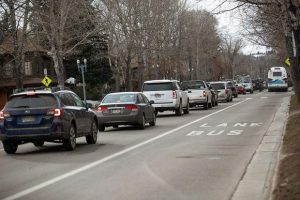 But the balance of our schedule called for miles of travel beyond Glenwood, in seasonal weather that tapped skiers’ (lower case) souls. Certain types of gratitude did not move me deeply as a teen, but now I appreciate our coaches. Not only did they teach us to become better players, they also drove the buses. During many late-night returns from places like Battle Mountain, they negotiated blowing snow and icy curves through the old two-lane Glenwood Canyon. One trip stands out in my memory, and not for our stellar play. Coach Jan Tucker had booked a non-league game with McCoy. “Where is that?” you may wonder. We did, too. He explained that McCoy lies on the road between Vail and Steamboat. The town’s 2010 population totaled 24. Only six varsity players comprised McCoy’s team. Our team assumed an easy victory until the competition emerged from the locker room. One tall, muscular, skilled player — I think his name was Kirby — looked to be 20 years old. Although they didn’t slaughter us alive, Aspen lost the game. Track season incurred trips to Meeker and Grand Junction, the farthest we traveled for sports. During our senior year our coach spied a shortcut on the map he thought would be a faster trip home from Plateau Valley (town of Collbran). 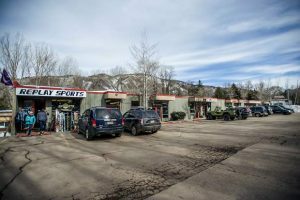 To get there we would drive almost to Palisade on Interstate 70 and then take a highway that backtracks eastward. 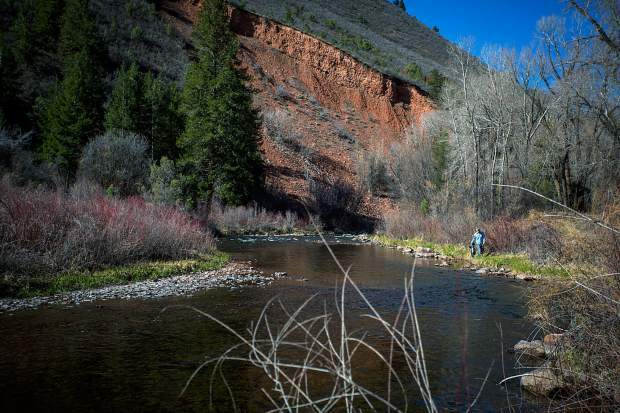 But our new coach’s shortcut stretched from Plateau Valley to the backside of McClure Pass along an unpaved, dusty, bouncy road. My complaints about travel would elicit from my father his “you should have been there when I was a kid” stories. When he had been my age, Colorado’s towns were even smaller and thus farther apart. He would tell of games against Basalt played inside the Emma Store, because no one had built a gym. One time they played a game during a winter storm. When it ended, they faced an unplowed road home. What would a team with the soul of a skier do? They deflated the tires and schussed the car home on the railroad track.